There is this new and amazing kids product that I want to keep to myself. But to be honest, this product is too good not to share with my most amazing readers and followers. And I am not good at secrets anyways. but your wallet will thank you. You know all those super expensive fruit and veggie pouches you buy. You buy them because you want your sweet face to be happy and most important healthy. for those extras that come up in life. 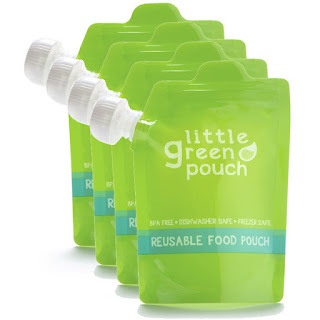 are reusable food food pouches. who want the freshest products for their children. so you can see how much you are giving your child. Oh, and it even has a place where you can write your child's name on it! Seriously this might be the best product out there right now. I am so sick of buying those expensive pouches but have no other choice. Pouches are the only way my sweet face will eat any sort of veggie. Well, now I can make them myself for next to nothing. fill 'em up with either a spoon or funnel (you can purchase the funnels on their website). And now you have a healthy meal or snack for your sweet face. a 4 pack of Little Green Pouch. So, you can try them out for yourself. I promise you that you will not be dissappointed and soon you will be telling all your friends about them. It has a zipper seal?! I was wondering how I would get the food in the little spout - but the zipper seal on top is genius. I make all of Ben's baby food and we've come to a point where I've been buying the pouches because he can feed himself, eats more out of the pouches, and they are less messy - I legit was thinking, "Man, someone needs to start selling the pouches empty!" And here they are. Something new and fun from their website: They are having an instructional video contest and you can win 12 free pouches! I love that these are dishwasher and freezer safe!!! So excited to have found this product! They have a recipe section and you can even submit your own recipes! I am loving this product! Thanks for sharing!! They are all sold out right now, but you can be on their waiting list! kids dont think twice before diving into these! they look just like the real thing :) WE LOVE THESE!